This photocopiable activity book helps teens and tweens who are feeling voiceless, ineffective or fearful in response to events at a world, community or individual level. It incorporates exercises using art and craft, nutrition, mindfulness, yoga and other movement based activities. 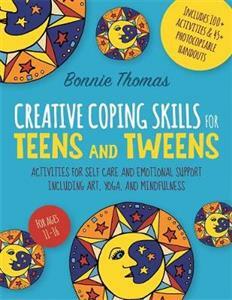 This book offers dozens of suggestions, interventions, and activities for ways that tweens and teens can care for their physical and mental health, including managing life's stressors, how to recognize 'red flags' in a relationship, and listening to their body's intuition more often. Ideal for mental health counselors, social workers, program coordinators, and other providers working with this age group, it can also be used by parents.